Amazon‘s gleaming-new music subscription service stepped into the market today, and we dove in quickly for a test drive. Prime Music is a subscription-only, on-demand, interactive music service bundled into Amazon Prime, the free-shipping-plus-media plan with millions (exact number unknown) of members. It packs value into an existing ecosystem that includes movie and TV-series streaming (like Netflix) and Amazon devices that are optimized for Amazon content (like Apple). As such, while Prime Music will compete with Spotify, Rhapsody, Beats Music, and other online jukeboxes, it has a unique value equation targeted to existing Prime customers. We tested Prime Music in its desktop browser mode. Although Amazon promises access across all types of devices, we did not find Prime Music in iPhone/iPad/Android apps, or (surprisingly) in a Prime-enabled Kindle Fire HD tablet (which Amazon says will be auto-refreshed for the new music service). Entering Prime Music, you are funneled to curated playlists provided by Amazon, and the emphasis is decidedly on lean-back listening. This slant is not too unusual for an on-demand service, as most platforms recognize that many people don’t want to search, or think much, before getting the music started. Amazon might have another reason for pushing the on-demand function aside: Prime Music is launching with a relatively small catalog. The world’s largest record label, Universal Music Group (UMG), is not in the service at all. Beyond that void, current top hits are not necessarily included in the mix; we checked the top five songs in Billboard’s Hot 100 chart; only one of them was in Prime Music. 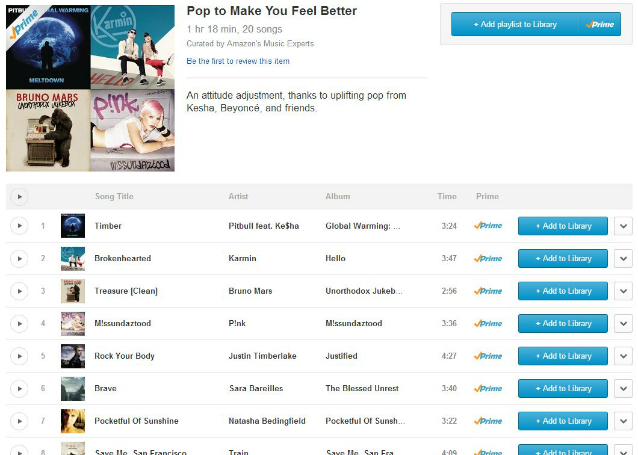 The front page promoted “Popular Prime Playlists” (an amusing data implication for a service less than one day old), including “Pop to Make You Feel Better,” “Indy Feel-Good Music,” “Happy Modern Pop,” “Feel Good Country” — 20 playlists in all. All that feeling good made us a little depressed, but we pushed through for some playlist enjoyment. Clicking a playlist does not play it in normal fashion, sadly. We heard excerpts of the songs, as a non-member of Prime would. This frustrating puzzle was solved when we finally noticed the “Add playlist to library” button. When we did that, we were shunted to Amazon Music, which embodies Amazon’s cloud-playback service where you can upload music files for mobile listening. It makes sense to provide a bridge between these two services. It makes trouble to force the connection. We want the playlist to just play, within Prime Music. Things got more confusing when we saw that the 20-track playlist was mysteriously reduced to eight tracks. We tried another list, carried it over to Amazon Music, and were unable to view the list at all as it was playing. It’s important to note that these browser experiences might be ameliorated in mobile apps which were not available for our review. For example, our Amazon Cloud Player app, which represents Amazon Music (too many brands! ), did not recognize the library additions we made from Prime Music. But a future upgrade might bring that cloud connection to life. Notwithstanding the emphasis on playlists, Prime Music does allow searching and genre sorting. The usual list of music categories is present. We selected Blues, and received a sub-genre list of nine Blues types — nothing surprising or original there. Jazz had 14 breakouts. Classical divided into musical forms (e.g. etudes, sonatas) rather than sub-genres (e.g. opera, symphonic, 20th-century), which was odd and interesting. Amazon helpfully includes the number of available tracks in each genre — considering the small catalog, that seems like a risky decision. When guitar god Carlos Santana appeared in our testing, the notation telegraphed only 11 available tracks. Following that trail, we found only a single compilation album representing Santana in Prime Music — an infinitesimal and unimportant representation of his discography. Weeping ensued. Generally, we found erratic stream performance, with intermittent long delays before a song started up. In more than one case, we could not get any track of an album to make the slightest sound. In those cases, adding the playlists to our library got them going. In all cases, as we noted with playlists, hitting the Play button for an on-demand song or album delivers excerpts until it is added to the Library. Prime Music seems to exist as an audition ground for building a collection. We frankly consider this a terrible user experience (pending how it works in mobile apps). Hitting Play should result in a play. Prime Music should be the listening platform, not a Library which is part of a different Amazon service. Prime Music feels like a beta service on its first morning, but we don’t judge glitches during a launch. Beats Music suffered terrible problems during its entire first week in January, and publicly apologized. We are disappointed that our Prime-enabled Kindle Fire did not quickly update for Prime Music, and that our manual updates of mobile iOS and Android apps did not show us Prime Music in time for this review. That, too, is beta-ish … though we have received notes from others saying their updates worked. We find the laborious connection between Prime Music and the Amazon Music Library cumbersome and ruinous to enjoyable use of Prime Music as it exists in a desktop browser. The catalog is demonstrably small, with obvious voids in which one’s listening hopes are extinguished. But all this might not matter to the intended audience, which is (for now, at least) existing Amazon Prime members. They get a sudden infusion of new, free media content, packing additional benefit into a service that already shines with value. Prime Music doesn’t have compete with Spotify feature by feature. Amazon can sand the rough edges and build out the catalog from here, with each improvement making things even better for millions of existing customers. As of today, Prime Music is instantly one of the largest music subscription services in the world. We look forward to seeing it improve and more fully deserve its huge audience.